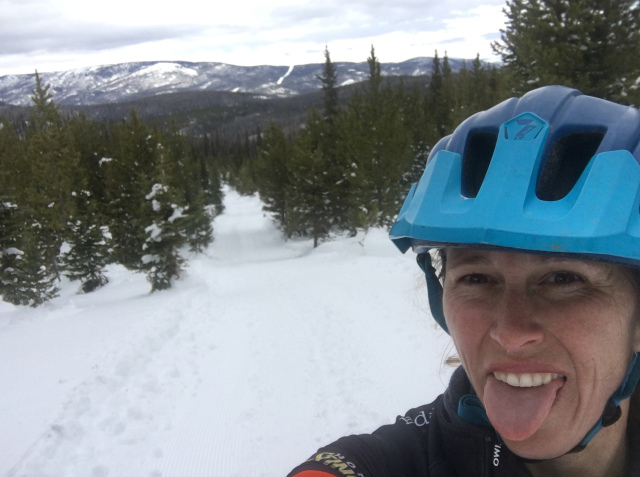 This story brought to you by ShredWorthy contributor, Betsy W., out Colorado. You can read the original posting of this story on Betsy’s blog, For the Love of Fat. Before signing up, I hadn’t really talked much about The Bear, a local Colorado winter endurance fatbike race. But truthfully, I’d been dreaming of this race for as long as I’d been pining to race the Fat Pursuit. It felt like I’d been dreaming of it forever. When I learned of the Fat Pursuit in fall of 2017, I also learned about the 2018 inaugural “The Bear” 50 and 105 mile event, slated to take place in the mountains of Steamboat Springs. Colorado doesn’t have many options for winter ultras or even mid-distance (greater than 30 miles) fatbike events (the exception being the Silverton Whiteout, which is a 10 hour fatbike race). So, I remember well when The Bear event popped up in my Facebook feed. I quickly self-evaluated and considered the 50 mile distance. Since I was working up to a winter ultra of 100 plus miles, getting 50 miles under my belt made perfect sense to me. Realizing that I hadn’t yet crossed into the threshold of endurance riding at that point in time, I decided that I would build up more experience before jumping off that metaphorical cliff. I promised the race organizer that I ride The Bear in 2019. A promise that I kept. On the first of February this year, myself and my new friend Jill, who I started riding with in the late fall, stuffed our two fatbikes and gear bags into my vehicle and drove three and a half hours north to Steamboat Springs. We had both excitedly committed to riding The Bear 50 mile course (the only distance option for this year) weeks before and had been looking forward to race weekend. 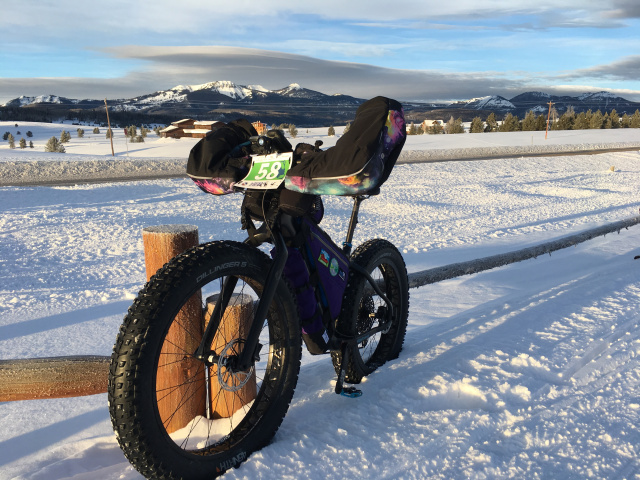 Hahn’s Peak Roadhouse, a simple and wholly rustic establishment including a restaurant, bar, fueling station and various small cabins, was the perfect place to stage a winter endurance fatbike event for the weekend. It is strategically situated as a gateway to the Medicine Bow-Routt National Forest and is surrounded by Steamboat Lake State Park to the south, multiple peaks to the west, north and east and a vast network of county and forest service roads in almost every direction imaginable. In the winter, the Steamboat Lake Snow Club grooms those miles of forest service roads for winter use trails. The course would take us up near 10,000 feet with views of the Continental Divide and some of the seldom seen peaks of northern Colorado, such as The Zirkels. The Bear was going to be similar in distance to the Fat Pursuit 60k, but almost twice the climbing. At 5,000 feet of climbing, I was a little nervous of how I would do. Not only would it newly top the list as longest distance completed in winter, it would also top the list of biggest climbing day. I really hoped I was ready! When we pulled into the venue, I wondered if this is what it might look like in Alaska if I got the chance to experience a winter ultra-event there. While I have no firsthand experience in Alaska yet, I felt as though I was there. The landscape was wonderfully primitive, and unpolished. Natural. Simple. Nothing like the posh ski resorts I was used to in my snowboarding days. I couldn’t help but to indulge my own excitement about this adventure I was taking on. My pedal Racing teammate Mark had rented a small cabin and graciously allowed Jill and I to take over the place’s tiny loft outfitted with two twin beds. Once we settled in, the three of us took off to pre-ride a few miles of the course. We were anxious to see how it would be riding since the temperatures hadn’t been very cold leading up to race weekend. Little Mountain and Beryl Mountain came into view once we rounded a corner and came out into a clearing along Ways Gulch. We rode the first 5 miles of the course and were very pleasantly surprised to discover that it was firm and fast rolling! I spotted a few fresh sections of perfect corduroy – groomed, but not yet ridden trail - my favorite! The sun was shining and warm, the skies were blue and the temperatures were in the mid 30’s. It was one of those moments where you just can’t stop smiling. The further we rode, the more we smiled! It was a gorgeous day, perfect weather, perfect trail conditions, and inspiring views of the surrounding peaks. My heart swelled with joy. We continued our gradual climb up to Twin Mountain before I finally expressed trepidation to Jill about burning my legs up before tomorrow. Like her, I really wanted to keep going but the conservative voice in my head suggested we turn around and rest up for the big day tomorrow. And so, reluctantly, began the pedal back. That night, back at the roadhouse, we checked out the course map at the racer meeting. One of the volunteers got concerned that I would get lost because of all the questions I was asking! Jon, the race director, reassured him I would be just fine! The morning of the race! Riders getting ready for the take-off! Race morning came early and cold. It was overcast and 5 degrees. The forecasted daytime temperatures were expected to reach into the mid 30’s again which made dressing for the race a little challenging. I didn’t want to dress too warm and have lots of layers to shed midway into the morning but I also was dreading a shivery start! Logic for the long run won over and I went with dressing for a shivery start. I joined in with the other racers who were pedaling around the roadhouse trying to get legs warmed up. I was anxiously avoiding eye contact with the clock – the race start couldn’t come soon enough! If I wasn’t riding, I was pacing. Waiting is SO hard! I saw several familiar smiling faces that I recognized from JayP’s Fat Pursuit and said hello. Someone told me once that going to these events is like a family reunion. You get to know the crazies that love to do the same thing as you! Without much fanfare, or I missed the parting words altogether thanks to my socializing, the race began! Now I could relax and just pedal. As I headed up the road, I tried to remind myself what another veteran, Chris Plesko, told me when I had bugged him for advice on racing The Bear. “Start conservatively. It should feel easy at first.” My goal for the race was just to FINISH. I wanted to make sure my start allowed me to do that. I expected to be out there for at least 7 hours given how my Fat Pursuit 60k went. No need to burn up my energy in the first handful of miles! I giddily pedaled away and stayed with a small group of women: Myself, Jill and Beth Shaner. Both of them having way more experience than me, I was happy for the company while I could hang with them. As we began the first significant climb at Twin Mountain, Jill and Beth pulled away and I was finally alone. Mid to back of the pack racing, my sweet spot. I could settle into my own routine and just focus on riding at my race. Pedal, drink, eat, repeat. The first big climb, a little over two miles long, was steep enough that I crept along at an embarrassing two miles per hour and took a break whenever I felt as if my lungs or legs might explode. I tried not to let it eat at me mentally, since I knew that I had an even bigger, longer and steeper climb ahead. Occasionally I looked over my shoulder to see if anyone was catching up to me. For me, the best part about climbing is remembering that what goes up must also come down. Once I finally crested the top of the climb, it was a fast mile long descent before hitting the undulating valley floor. The stretch of course that I was now on, in the middle of the figure eight loop, we would ride twice. The first time coming through I rode it relatively quickly as the course was still firm. Some sun was poking through the clouds making the edges of the trail easily distinguishable from the rest of the great white expanse of land. Hahn’s Peak was also visible to my left. Again, a thought flashed through my mind: Is this what Alaska is like? Here I was all alone, no one visible in front, no one visible behind me. Nothing but a firm groomed trail ahead of me and mountains surrounding me. White silence. I embraced it and enjoyed every possible minute. This was my Alaska, for now. At approximately mile 11, and at the point that we finally turn north for the top half of the figure eight course, I came across the aid station. I took a mental account of my food and water rations, calculated that I wouldn’t see the aid station again for another 24 miles, and decided I could make it without stopping. The volunteers cheered me on as I rode past. There weren’t any other racers at the aid station when I passed through and I hadn’t seen anyone on the long valley stretch behind me either. So I knew I was truly alone. I didn’t have the course precisely memorized but I knew my biggest challenge of the day lay ahead not too much farther. When I first checked out the course profile weeks earlier, I had gasped when I saw a section of the big climb registered at a 20 percent grade. I remember asking Jon, the race organizer, if that was true and he was very matter of fact about it. Yep! It’s that steep! Prepare for some hike-a- bike! I had been mindfully trying to pace myself the previous two and a half hours to try give myself the best chance at tackling the climb up to 9,800 feet, the highest point of the course. Hiking my bike up the steep. The big climb was seven miles long and amounted to nearly two hours of grunt work! I rode as much as I could and hiked a pretty good amount of the steeper pitches. At one point, the course safety crew on snowmobiles approached me as I was hiking. Of course, they grabbed a picture of my suffering. The one thing I tell myself for every ride is that a positive attitude is everything. It has always helped to keep me going, even when the going gets tough. Later, when I saw the picture of me hiking my fatbike up the slope, I see that, despite the stuffer, I am still smiling. Sure it was slow going and fairly tiring, but I asked myself what else would I rather be doing? And that was it. I embraced the climb fully and the reward of topping out and seeing some riders off in the distance was very sweet. In my mind, the rest of the race was all downhill. I had made it! Pictures never do justice but that is one long, steep climb! It was tiring! I stood there at the top and took in the scenery for a minute or so. I marveled at how steep the drop in was that I was about to do - about a 25 percent slope. I don’t mind fast downhills but this could get a little sketchy if I let loose. I decided to descend conservatively. My energy levels had definitely dropped from the climb and with my fatigue, it would be easy to make a mistake and send myself tumbling down the mountain. It took me another hour and a half of pedaling until I came across the part of the figure 8 course that I had already ridden. Time felt like it was slowing down and every pedal stroke started to feel more arduous. I was almost 6 hours into the race and had another ten miles to go. When I hit the middle of the loop, the light was super flat. I struggled to find definition in the ground beneath my tires and the trail out in front of me. I worried about wandering off the trail and punching through the deep snow on either side. The snow was no longer fast and firm. The afternoon’s warmer temperatures had taken their toll and conditions were turning soft and mushy. Once again, I was reduced to an embarrassing crawl. Taking what felt like an eternity to travel a mile and a half to the aid station. When I finally arrived at the aid station I was exhausted. I decided I would stop and dig into my snack bag for some treats. I commented to a volunteer how difficult it was to see the course in that long, flat stretch with the flat light and he said oh yes, we call that section “Siberia”. It did feel rather desolate that time. Turning onto the road at racer’s headquarters! Home free! The last 8 miles after the aid station were, without a doubt, the hardest part of the entire day. I thought the big climb would do me in, but instead, it was the last part of the course that was the most difficult for me. The temperatures were warm, the conditions were soft, the last leg of the groomed course had seen considerable bike and snowmobile traffic and was all churned up. Then finally, there was one more significant climb that I had completely missed in my reconnaissance of the course profile. I felt utterly defeated. I fell over a few times, I walked a handful of times and I almost succumbed to just lying down in the middle of the course for a nap. I was so tired. I had to dig deep to just keep moving. Numerous times I questioned whether I could even complete a winter ultra distance. What was I doing out here? I can barely even complete a 50 miler (actual mileage was more like 45). I was feeling at the lowest of my lows. When I finally hit the final stretch - the road for Hahn’s Peak Village - I was flooded with sheer relief. Like a horse who knows they are almost home, I took off. A quick burst of energy both mentally and physically drove my legs to pedal as fast as I could for that finish line. A mile or so later, I dashed into Hahn’s Peak Roadhouse drive while Jon, Julie and other race friends cheered. I was beyond relieved to be done! My official time was 8 hours and 5 minutes. I finished 6th out of 8 for the women’s field and 25th out of 31 racers overall. Mark and Jill caught me outside the roadhouse for a big “Congratulations.” They had been watching my dot on TrackLeaders and waiting for me to come in. I was all smiles while I told them that I couldn’t believe I actually did it! I felt on top of the world. For the second time, I was able to set a big goal, one that I questioned whether it was too ambitious, I worked hard in training and set out believing I could succeed. And I showed myself that I could. The rest of the evening was a celebratory but sleepy blur. All the racers hung out gorging on food in the roadhouse, swapping stories and hanging out for the awards. I think the highlight of the weekend was experiencing the camaraderie among everyone. From Derek, the life of the party, to Graham, the impressively strong Kiwi riding The Bear fully loaded in training for the Iditarod Trail Invitational later in the month. Jon and Julie, the warmest and most encouraging human beings, Erika, the most mentally tough yet kind and positive soul. My teammate Mark, who is just incredibly fast and fun to be around (Mark won the race) and Jill, who is the most rich in outdoor adventure of anyone I’ve ever met. Being able to spend time in good company at a well-organized and awesome event was another great memory made and to be forever cherished. I am fairly certain that I will be back for more next year! Like what you just read? Maybe you have a story that you’d like to share? Become a ShredWorthy contributor by sharing your cycling stoke here!